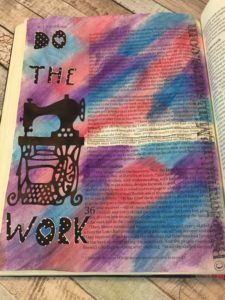 This week I chose to complete Bible Journaling entries from the books of 1 John, 2 Kings, Ruth, Psalms, Exodus, Jeremiah, and 1 Samuel. Pages of the Bible are generally black and white, so in these entires I added a lot of extra color to brighten them up. 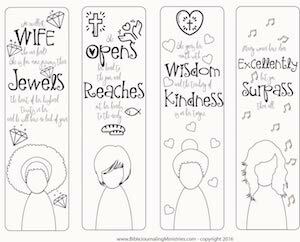 I’ve provided links to supplies if you’d like to support our ministry with your purchase. 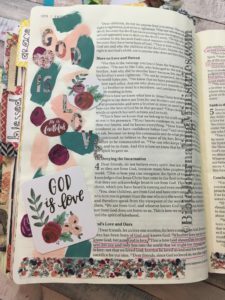 Our Illustrated Faith I Am kit was a big help in this bible journaling entry in the book of 1 John. I used mixed media for this one. To see my review of this kit, go here. 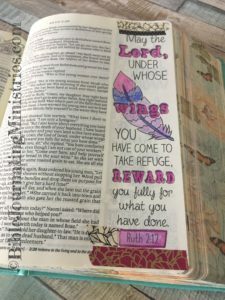 I made this Bible Journaling entry in the book of 2 Kings of my Canvas Bible come to life by using Gel Pens. 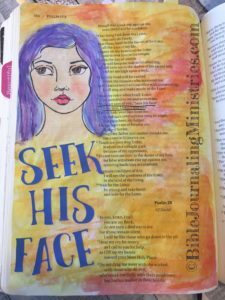 I went with a purple color scheme to complement this Bible Journaling entry in the book of Ruth. It features my Inspire Bible and colored pencils. 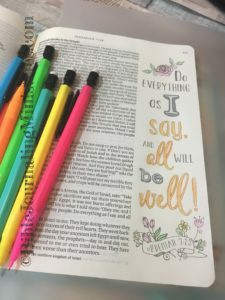 I hope this Bible Journaling entry in the book of Psalms really brightens your day. I stamped her face and used watercolors for the background. 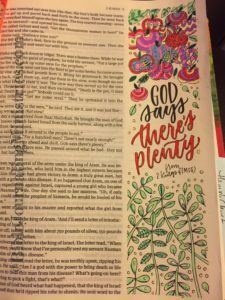 I highlighted one of my favorite verses in this Bible Journaling entry from the book of Exodus. I used Gelatos and Die Cut Vinyl stickers to achieve this look. 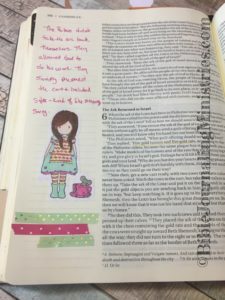 I really wanted to like these Dollar Store pencils I used for this Bible Journaling entry in the book of Jeremiah, but they just kept breaking. What journaling resource is your secret weapon? Sometimes you don’t need a lot for a great Bible Journaling entry. This one in 1 Samuel only uses a sticker and Washi tape. It comes from my ESV Bible. Can you explain what tip-ins are and also what are gel at os?